The biology tray trolleys have been designed and manufactured specifically for Repton School for within the biology department. The solution consists of 3 shelves and is required to carry trays and fit under worktop areas for storage. 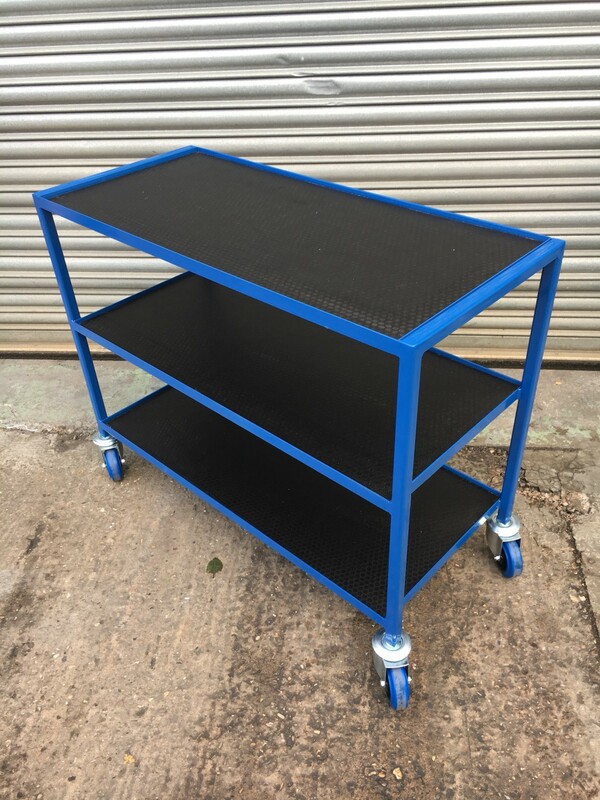 The tray trolleys have been manufactured from 25mm x 25mm box section and 25mm angle for the main frame work and fitted with 12 mm thick phenolic plywood for the shelves. To manoeuvre the trolleys 4 swivel castors with 100mm diameter non marking wheels have been fitted. The tray trolleys have been powder coat finished in BS 4800 20 D 45 ripple effect blue to provide a hard wearing durable finish. Approximate overall size – 1000mm (L) x 485mm (D) x 750mm (H) with 255mm spacing’s between shelves.